Der Spiegel has obtained audio of the heads of state negotiating in the final hours of COP15. Its fascinating stuff. The headline reads, How China and India Sabotaged the UN Climate Summit. This point was actually raised back in December by Mark Lynas at the Guardian (there’s a nice discussion and event timeline at Inside-Out China). On the surface the video supports the view that China and India were the material obstacle to agreement on a -50% by 2050 target. However, I think it’s still hard to make attributions about motive. We don’t know, for example, whether China is opposed because it anticipates raising emissions to levels that would make 50% cuts physically impossible, or because it sees the discussion of cuts as fundamentally linked to the unaddressed question of responsibility, as hinted by He Yafei near the end of the video. Was the absence of Wen Jiabao obstruction or a defensive tactic? We have even less information about India, merely that it objected to “prejudging options,” whatever that means. Some in the room felt queasy. Exactly which side was Obama on? He couldn’t score any domestic political points with the climate issue. The general consensus was that he was unwilling to make any legally binding commitments, because they would be used against him in the US Congress. Was he merely interested in leaving Copenhagen looking like an assertive statesman? It was now clear that Obama and the Chinese were in fact in the same boat, and that the Europeans were about to drown. This article and video almost makes up for Spiegel’s terrible coverage of the climate email debacle. Check out my guest post at Inside-Out China. I’ve been looking over the final COP15 decision (here, for now). So far it all looks nonbinding. I was curious how some of the players are reacting. “The world’s nations have come together and concluded a historic–if incomplete–agreement to begin tackling global warming. Tonight’s announcement is but a first step and much work remains to be done in the days and months ahead in order to seal a final international climate deal that is fair, binding, and ambitious. It is imperative that negotiations resume as soon as possible. “The agreement reached here has all the ingredients necessary to construct a final treaty–a mitigation target of 2 degrees Celsius, nationally appropriate action plans, a mechanism for international climate finance, and transparency with regard to national commitments. President Obama has made much progress in past 11 months and it now appears that the U.S.–and the world–is ready to do the hard work necessary to finish what was started here in Copenhagen. Two years have passed since world leaders promised all of us a deal to stop climate change. After two weeks of UN negotiations, politicians breezed in, had dinner with the Queen, a three hour lunch, took some photos, and then delivered what could only be described as the 24-hour Head of State tourist brochure of Copenhagen instead of a climate treaty. I’m in Copenhagen and President Obama has just wrapped up a press conference here announcing that a meaningful climate deal has been reached. While there is still much work to be done, the deal reached is a breakthrough for international climate cooperation and provides a path forward towards a binding global treaty in 2010. Significantly, the United States and China will – for the first time – both be at the table, working to tackle the historic challenge of global climate change. Additionally, the deal allows for more transparency, as developed and developing countries have now agreed to list their national actions and commitments regarding greenhouse gas reductions. “We agree with President Obama on the importance of addressing global climate change. However, Congress’s leading proposals could destroy millions of jobs, drive up fuel prices, and, by shifting much of our refining capacity abroad (along with refinery greenhouse gas emissions), substantially increase our reliance on foreign supplies of gasoline, diesel and other petroleum fuels. Worse, the president’s own EPA is poised to issue an expansive regimen of climate regulations that could cripple business growth and job creation, dimming employment hopes for 15 million now out-of-work Americans. Can’t find a final reaction yet: USCAP, WWF, ECF, and many others. Seems like the press releases haven’t all hit yet. Update 12/22: a nice summary at Roger Peilke’s blog. In short, not much for us to analyze. The headline today is that emissions pledges don’t match needs. 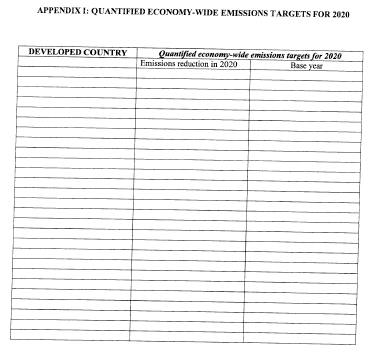 A leaked UNFCC secretariat memo indicates that current commitments hit 3C. * A ClimateInteractive reference is scrawled in the margins. It’s interesting that this is regarded with surprise, as we said it in March, Rogelj et al. said it in Nature in June, and it was intuitively evident before that. Climatescoreboard, climateactiontracker, and others are now monitoring the possible outcome in near-real-time. Our dream, over beers in Copenhagen on Thanksgiving in 2008, was to provide fast feedback to inject some reality into negotiations. It’s working! * Update: As Joe Romm points out, the Guardian and other coverage is just wrong. The secretariat analysis covers current commitments prior to COP15, not possible deals. The various drafts circulating (as you can see in analysis here this week) yield a wide range of outcomes, including 1.5C. There’s no way to nail down the final outcome until the contested bracketed text in the drafts is finalized. Update 2: We at ClimateInteractive are doing lots of evaluation of draft language using C-ROADS and a simpler emissions model that I developed, but we’re not going to report on the outcome until there’s a definitive text. Some of the insights from that analysis are reported in posts here this week, but obviously it’s all hypothetical at this point. That’s a nice sentiment, but the goals expressed here are not compatible. 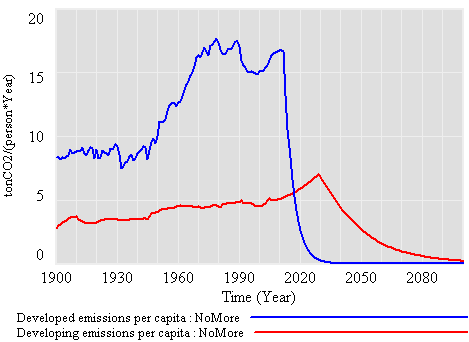 If you take “aspirational and ambitious” to mean 55oppm – much less stringent then a 1.5 or 2C target – we’re already halfway or more through civilization’s cumulative emissions budget. Most of the historic emissions occurred in the 20th century. The rest will happen this century. The problem is, there are a lot more people around this century than last. Therefore, this century’s remaining emissions budget just isn’t big enough to make up for historic inequity in emissions, even if you allocate it all to the developing world. NGOs are mad that registered participants are being excluded, so they stage a walkout. Isn’t that like going on hunger strike to protest a food shortage? For the record, I’m among the excluded. I don’t feel so bad now that friends tell me that I’m in good company – a former Danish prime minister didn’t make it in today, and even Al Gore had to wait an hour. Bill McKibben stopped by to chat. He pointed out the current low price tag on deforestation proposals – $25 billion per year. A Big Mac, Coke and fries for everyone in the developing world. Yay! I’ve added the Dec. 16 Kyoto Protocol working group draft to my summary table. There’s not much to report with respect to the global outcome. Most of the detail is focused on Annex I (developed) country commitments. There are so many options and brackets in the text that it’s hard to draw any concrete conclusions about the implied emissions trajectory. There’s possibly an interesting disconnect around characterization of the second round of targets. Currently there are a number of options included in bracketed text. First, the endpoint could be either 2017 or 2020. Second, various options suggest a range of cuts between 15% and 49% below 1990. This range corresponds roughly with the range typically cited as providing a decent chance of hitting a 2C target (see AR4 WG3 Ch. 13 box 13.7, pg. 776, for example). 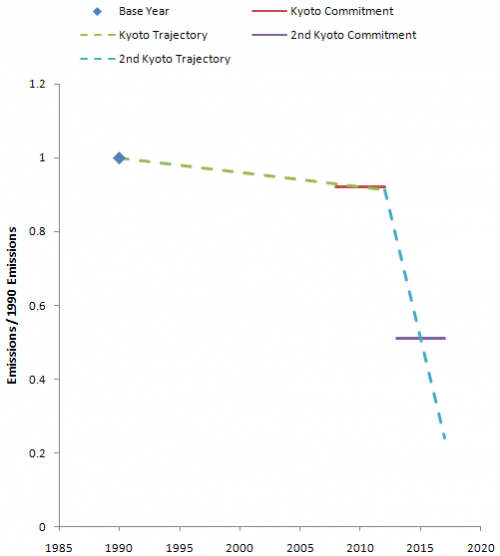 If you think back to the first Kyoto agreement, countries committed to small cuts relative to 1990 for a commitment period from 2008 to 2012. For the EU, with an 8% cut, that meant averaging 92% of 1990 emissions over the commitment period. If you imagine that emissions fall along a linear path from 1990, that means that emissions at the midpoint (2010) would be 92% of 1990, and emissions would be a little higher prior to that, and lower after. Because the slope from 1990 through 2012 is shallow, a viable trajectory would include a 7% cut in 2008 and 9% in 2012. No big deal. However, for the next commitment period, the slope is a very big deal. The deepest cut in the AWG-KP draft is 49% for the developed world. I suspect that number is anchored on upper end of the AR4 2C range (25-40%), moved up a bit. 49% still sounds plausible. But there’s a problem: to achieve a 49% average over 2013-2020, starting from a 9% cut in 2012, you’d have to do one of two things: reduce emissions an additional 37% overnight, then keep them there (basically impossible), or reduce emissions by 13 percentage points per year, arriving at a cut of 76% in 2017. That’s a year-on-year reduction rate of 15 to 35% per year. That’s pretty tough going, given that, even if you never build another bit of carbon-emitting capital, natural turnover takes you down at 2 to 5% per year. I’m all for strong targets, but abandoning capital at 10% per year is going to be a tough sell. It’s not clear to me that this is intentional. I think it’s quite possible that misperception of the dynamics of a target accumulated over an interval leads to false conflict, as desire to achieve a point goal (e.g., -40% in 2020) is confused with a much more stringent goal over a long interval.